There are a number of metrics that are considered during the development & release of any software product. One such metric is the ‘user-experience’ which is centred on the ease with which your customers can use your product. You may have developed a product that solves a problem at scale, but if your customers experience difficulties in using it, they may start looking out for other options. Website or web application’s which offers better web design, page load speed, usability (ease of use), memory requirements, and more. Today, I will show you how you can measure page load time with Selenium for automated cross browser testing. Before doing that, we ought to understand the relevance of page load time for a website or a web app. Why Focus On Measuring Page Load Time? Popular search engines measure the time it takes for the receipt of the first byte in order to determine the site speed/page speed. Hence, slow rendering pages can have a huge hit on the search engine rankings. Slow page speed also means that the search engine crawler can crawl less number of pages within the allocated crawl budget, which would eventually show up in the rankings. A fact known to most of us is that if a website offers a more mobile-friendly user experience with faster page load time on mobile, Google would value those websites more and rank them on top in mobile search results. For this purpose, Google came up with a new mobile-friendly algorithm on April 21, 2015. Therefore, it is important to test a mobile website for user-friendliness. It is not just Google but your customers would also won’t prefer your website or web app if the pages on the website don’t load with lightning fast pace. 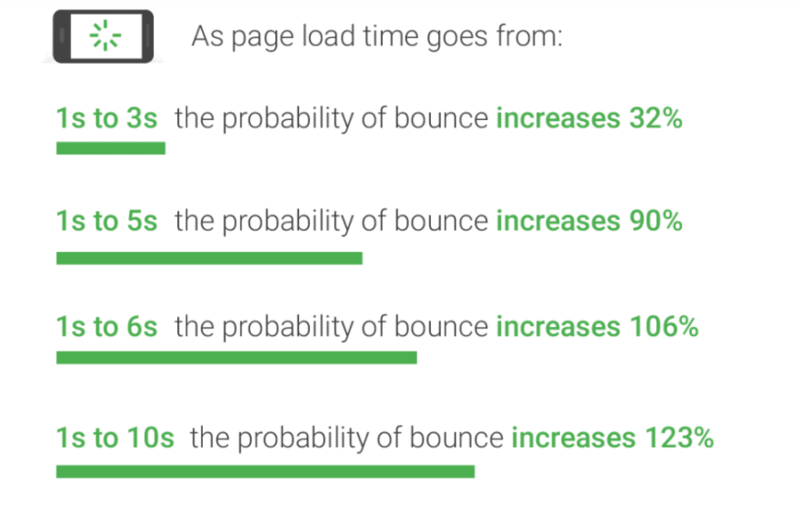 Even one-second delay in the page load time can result in higher bounce rates and reduced number of page-views. It also has a negative impact on Click Through Rates (CTR) and conversions. In simple terms, measuring page-load time (also referred to as Page Speed) is the amount of time it takes for the content/page to appear on the screen. Lower the page-load time, better is the usability factor of the product, better is your conversion rate. Different pages on the same website/web-app can have different load times, depending on the design being used for development of the pages. Developers might have used either of the techniques to reduce the page load time. a. File compression techniques for image optimization. c. Reduced number of redirects. That is from the developers end, but how would you go about testing the website by measuring page load time of every page? There could be hundreds of webpages on your website. Not to forget, you would have to perform browser compatibility testing to realize the page load time of every page on your website across hundreds of browsers and browser versions. There is a possibility that your web page load time will differ if accessed from different browsers (including browser versions). It would also depend on the platform (desktop, tablet, mobile, etc.) and the geographical location from where your website/web-app is being accessed. You can’t go about testing every combination( web page + browser + browser version + operating system ) manually. This is where Selenium grid comes to the rescue by empowering you to perform automated cross browser testing of your web pages. You can perform automation testing for measuring page load time with Selenium. Before we do that, it is important to have a look at the Navigation Timing. The Navigation Timing API is available in most of the popular web browsers namely Firefox, Chrome, Internet Explorer, etc. Though there are the number of interfaces available for Navigation Timing, most of the details related to page load time can be accessed using the properties of the window.performance object. The window.performance returns more accurate results since the API makes use of HRT (High-Resolution Time) to calculate the necessary timings related to a web page. navigation – Details about how the user navigated to the web page. timing – Information about the navigation & page load events. Other interfaces that are available as a part of the Navigation Timing API are PerformanceNavigationTiming , PerformanceTiming , PerformanceNavigation. Performance data is pushed from the client side to server side with the help of an XHR (XMLHttpRequest). 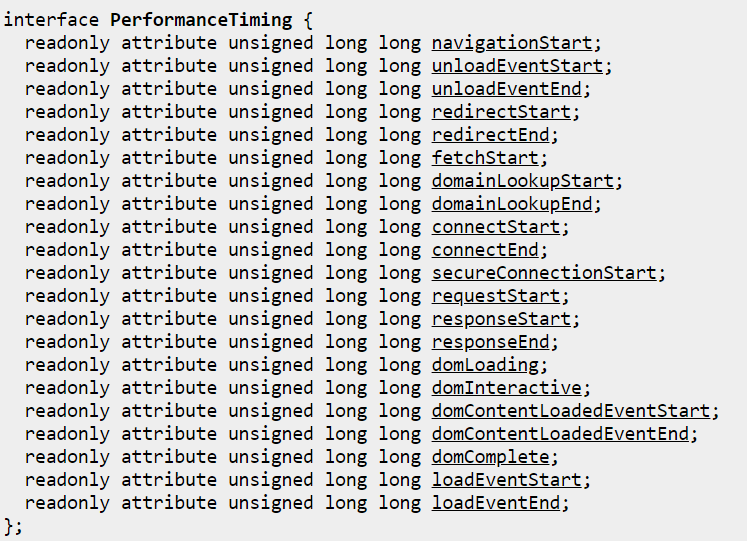 Using the Navigation Timing API, you can keep a tab on every request. Time is taken for loading the new page, the time is taken for unloading the previous page, time encountered for looking up the domain name, window. onload total time, response start time, etc. are some of the properties that can be accessed via the window.performance property. Below is an image representing the elements of PerformanceTiming interface. The timing property returns important performance information about the current page/document e.g. details about navigationStart, connectStart, connectEnd, domainLookupStart, domainLookupEnd, and more. The figure below shows the order of performance of navigation.timing events. Each performance.timing attribute shows the time of the navigation event i.e. when the previous page was unloaded? when the latest page was requested? when the Document Object Model (DOM) began loading the page? and more. The timing is in milliseconds which is calculated since midnight of January 1, 1970 (UTC). You can have a look at the official W3C documentation on PerformanceTiming interface in order to get more information about each event. Though you can access the window.performance through your source code, in order to see window.performance in action, you can access the option via the debug console of the browser (Firefox, Chrome, etc.). For example, open the LambdaTest website in Firefox/Chrome browser. In our case, we are using the Firefox browser. Now open the Inspect Element option to go to the debug console. Open the console and key in window.performance.timing in the console window. As seen from the output window, window.performance returns the performance object which also contains the timing property. Further details about Navigation Timing API and corresponding browser compatibility can be found here. You can make use of Selenium to measure the performance of a web page over a period of time. The results that are obtained from the Navigation Timing API can be further used to improve the page load time with Selenium testing and also benchmark those results against your competitors web performance. Though there would be visible differences between the home page & functionalities provided by two websites/web-apps (solving a similar problem), it is still important that the page load speed is equal (if not better) than your competition. Along with tracking & benchmarking the web-page performance, Selenium can also be used to log the statistics of the page to come up with improvements on the client-side. As far as the server side is concerned, major performance improvement can be obtained by making use of the right kind of infrastructure. Let’s have a look at an example where Python is used along with the Selenium framework to capture important statistics about the web-page (e.g. lambdatest.com). It is an example that you can use to get started to measure page load time in Selenium. navigationStart – This attribute returns the time spent after the user agent completes unloading the previous page/document. If there was no document prior to loading the new page, navigationStart returns the same value as fetchStart. responseStart – This attribute returns the time as soon as the user-agent receives the first byte from the server or from the local sources/application cache. domComplete – This attribute returns the time just before the current document/page readiness is set to ‘complete’. document.readyState status as ‘complete’ indicates that the parsing of the page/document is complete & all the resources required for the page are downloaded. We will have a look an example of domComplete in subsequent section. window.performance. timing.navigationStart, window.performance.timing.responseStart, and window.performance. timing.domComplete are the Timing Navigation options which are passed as arguments to execute_script() API. The measurement of time is in milliseconds (ms). We have used Eclipse as the IDE for development & testing of the test code. In order to execute the code, press (CTRL + F9) from your Eclipse IDE. Below is the output once the above code is executed, the output shows the time spent in the front-end & back-end activities of the web-page. We have a look at another example where we load a web-page and search for the presence of an element (div-id) in the page. We search for the div-id for timeout duration of 5 seconds. Once the page is loaded, div-id (in our case: owl-example) is searched for 5 seconds, after which an exception is raised if the owl-example div-id is not present on the web-page. All the necessary modules are imported at the start of the implementation. Test case 1 – The web-page being loaded is checked for the presence of div-id ‘owl-example-1’. Using the WebDriverWait interface, search is performed for 5 seconds. If‘owl-example-1’ is not present on the page, an exception is raised. element is the actual element on the webpage to wait for. It returns False if the element is attached to the DOM, else it returns True. We will make use of the pytest framework which we have already covered in earlier blogs. In the below example, @contextmanager is used which aids in allocating & releasing necessary resources when required. 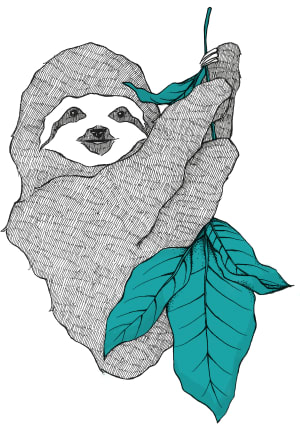 In wait_for_page_load(), search for the div-id owl-example is performed. WebDriverWait is used in combination with ExpectedCondition to achieve Explicit Wait condition. The driver and timeout are passed as arguments. We wait until the element gets stale. In case the element being searched i.e. owl-exampl’ is not present, a TimeoutException is thrown. This is how we check for the staleness of the element. In test_click_operation(), the webpage lambdatest.com is loaded after which a wait for the maximum duration of 10 seconds is performed. It uses wait_for_page_load() to check whether the element owl-example on the webpage is not stale. Once the webpage is loaded within the timeout, we check if there is an element which has link text FREE SIGN UP which is a button that is hyperlinked to the registration page. Finally, we check the status of web page/document using the Document.readyState property. When the value of this particular property changes, a readystatechange event is fired on the document object. Depending on the target market and the browser that is responsible for bringing you the most traffic, you should create a cross browser testing matrix to perform cross browser testing in an organized manner. Cross browser testing of your product would help you with the findings of valuable test cases which can further be used for improving the page-load times. 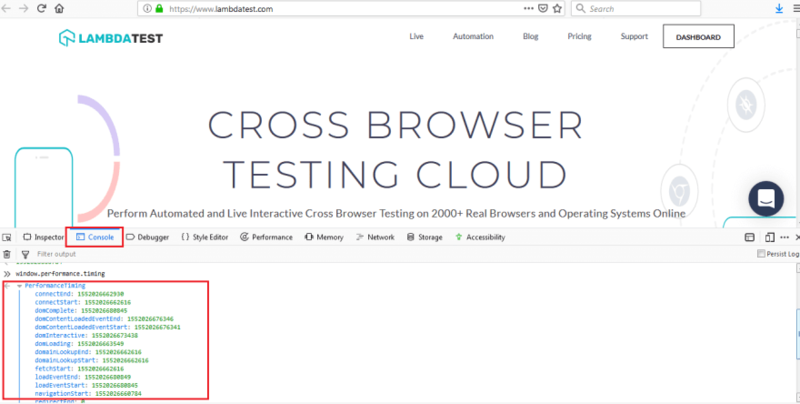 Rather than creating a local infrastructure to do these tests, you can make use of LambdaTest which offers scalable cross browser testing tool on the Cloud. Measuring page load time is very important for web-based products since it has a direct impact on the user-experience. Along with optimizing the overall design of your product, it is important to design web pages in a manner that the page load times are kept to the minimum. This would improve the conversions expected out of the product. Navigation Timing APIs are instrumental in keeping a measure of page load times. You can use the output generated by these APIs for optimization purpose. window. performance returns the performance object which gives important information about the current document/page. It can be used along with the Selenium framework. Measuring page load time with Selenium is critical as a web page can vary across different types & versions of browsers, hence it is important to focus on optimizing the page speed of your product on browsers & platforms for superior customer experience. How Pro-Testers Use CSS Selectors In Selenium Automation Scripts? I am an engineer with 15+ years of experience. Worked with multi-national companies as well as startups. Also an avid blogger on technology.